CSU Chico's Orion, with James and Talia! Chico State's student newspaper, The Orion, posted a video on bicycle theft last week featuring a few of us at Campus Bikes. You can check it out below, and keep your eyes peeled for our awesome employees, James & Talia. Budd Makes it into the Bike Month Edition of CN&R! May is made for celebrating bikes and bike culture. 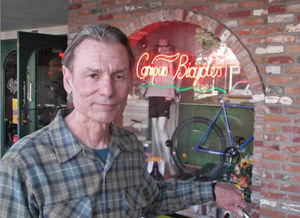 So, the Chico News & Review decided to get the scoop on our owner, Budd's, first bicycle. "It was a Schwinn Continental. I was making C’s and D’s in school, and my parents said if I got A’s and B’s and washed the dishes every night for a year, they’d buy me a bike. I had the cleanest hands in school [laughs]. The Continental was the best bike on the Schwinn dealer’s floor. I was in eighth grade at the time, and we’d just moved to California from Kentucky, where nobody rode bikes." James Makes it into the Bike Month Edition of CN&R! "Jim Vandewalle has worked as a bike mechanic for more than 30 years, a majority of that time at downtown’s Campus Bikes on Main Street. He is very familiar with the local bike culture, the good and the bad. Why is Chico so vulnerable to bike theft? “I think any college town is probably pretty fair game just because of the way college towns attract nice bicycles and thieves,” he said. From what he’s observed and heard over the years, theft is more often a crime of chance rather than the lure of an expensive bike. “It seems like mostly it’s a crime of opportunity,” Vandewalle said. “Most people who have nicer bikes also can afford a place to store them. Most bikes that are stolen, unfortunately, are the work-horse riders that some people use every day.”"
Our local cycling club, Chico Velo, sponsors an excellent series of rides throughout the year, including the famous Chico Wildflower (a Bicycling Magazine Top Ten Century!). Campus Bicycles proudly supports Chico Velo and invites you to visit their website for information and registration forms for any of the upcoming rides. The club's site also has descriptions of popular local riding routes with maps. Butte County has good terrain for all types of cycling - flat areas for commuting and leisure riding, as well as challenging foothills and mountainous rides. - Completed in June 2008. The maps are currently available at each local bicycle shop, the university, and the BCAG office. Campus Bicycles Got Second Place for CN&R's 2012 Readers' Choice Awards! We've been voted second best bike shop in town for 2012 by the readers of Chico News, & Review! And that's saying something, considering there are 10 of them! Thanks to all our loyal costumers for supporting us.